Farmers, agricultural workers and members of H&H Staff have been taking part in free health checks at a community event in Carlisle. Fifty-two people took part in health tests throughout the day, with around a fifth of those being advised to have further checks. The event was organised by the Rotary Club of Brampton & Longtown, working with the local NHS, local authorities and Lloyd’s pharmacy which offered blood pressure, blood sugar and cholesterol tests. 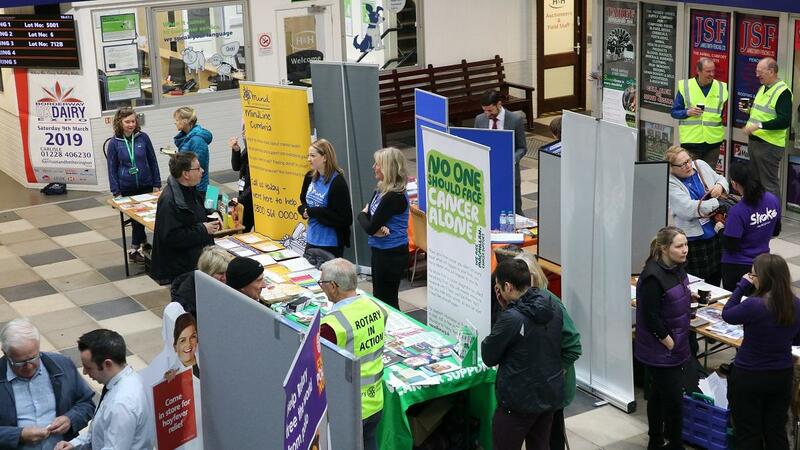 There were representatives from Carlisle & Eden Mind, Age UK (Carlisle & Eden), Stroke Association, MacMillan Cancer Support, Alzheimer’s Society, the Carlisle City Council Sugar Smart campaign, and Cumbria County Council Public Health team. Kevin Walsh of Brampton & Longtown Rotary Club, and Chairman of the Carlisle Dementia Action Alliance, helped to plan the event and said: “There was a great community atmosphere this morning, and it has been encouraging to get people thinking about their health and wellbeing – particularly those groups who often don’t ask for health advice.